The Church of Jesus Christ of Latter-day Saints was organized on April 6, 1830, with just six original members. In 2015 there were over 15 million Latter-day Saints, as it had become a global church. 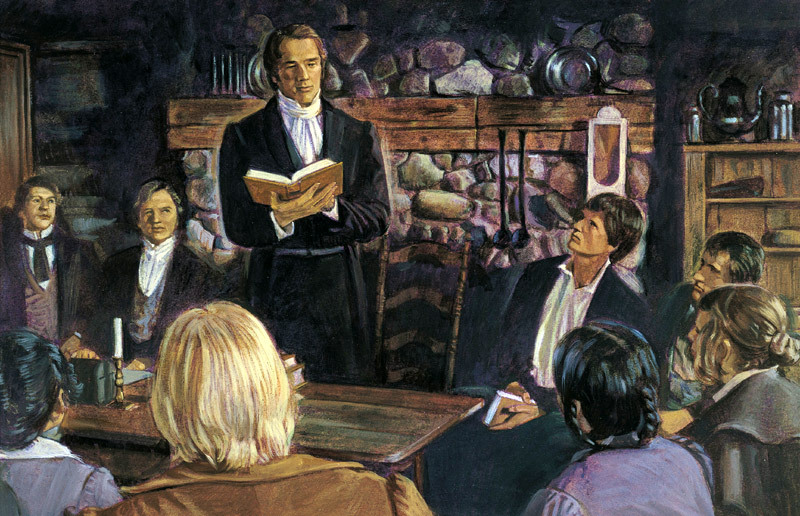 Guided by revelation from the beginning, its first prophet, Joseph Smith, learned from God that all things have spiritual import, even the temporal (temporary), earthly concerns of men. The Mormon Church was organized in 1830 and grew rapidly in spite of constant persecution. Because of this, the early new converts were encouraged to be industrious, and industriousness has been a quality of Latter-day Saints ever since. Mormons are always doing. Part of this is the fact that the Church has no real paid clergy, so every member serves in “callings” or roles within the congregation (“ward”), group of congregations (“stake”), mission, temple, ….well, the list goes on. Mormons are always serving. From the outside, then, Mormonism can look like a works-based gospel, but Mormons believe in grace. Not only for our every day or even dire needs, but in order to be saved. However, Mormons also believe in repentance, and really, this is our daily work. Mormonism is very efficient, and everything the Church does is coordinated and correlated. Church manuals are available to guide every congregation and every class. That means I can attend Sunday School in Orlando on one Sunday and review lesson 6 in the New Testament manual, and attend Sunday School in Paris the following Sunday and expect to review Lesson 7 from the same manual, only this time, in French. Lessons for children correlate with those for adults; lessons for men correlate with lessons for women, etc. Local Mormon congregations are administered by the lay members, who serve in positions as they are called. Members do not choose their congregations because a minister is charismatic and gives good sermons. Rather, members are assigned to congregations according to their geographic location. Even if you are not a Mormon (“LDS”) you can find out what congregation you would attend. Go to http://maps.lds.org and feed in your address. The name, location, and bishop (congregational leader) of your assigned ward or branch will show up, along with meeting times. The Church is organized so that concerns, plus new information and great ideas can move upward from the individual member to the prophet, and down from the prophet to each member. Visiting teachers are women who go by pairs to visit other women in the ward monthly to determine their needs. It is through them that compassionate service is administered when needed. Home teachers are men who go monthly to their assigned families to deliver a spiritual message and assess need. In times of general emergency, every member (and their neighbors) can be accounted for through this line of care and service. Women in Mormon congregations visit each other monthly to assess need and offer service and support. The Church has its own welfare program, more efficient than practically any on earth. It is shaped around self-reliance and designed to help families and individuals through temporary setbacks until they can get on their feet again. The welfare system also kicks in to help the Humanitarian Aid department in times of emergencies. The Red Cross is one organization that has been greatly impressed with how fast the Church can provide aid and how organized it is on the ground. Members just follow the organization set up in their wards and stakes, and they can do it instantly. Mormons are noticeable by their “Mormon glow,” which both members and non-members are able to detect. The glow is caused by the constant companionship of the Holy Ghost, which gift worthy members receive after baptism, and secondarily, the result of clean living. Mormons have a health code, given by revelation, called the Word of Wisdom, which forbids the use of alcohol, coffee, tea, tobacco, and recreational drugs (or abuse of any drug). Studies show that Mormons are healthier than the general population wherever they live. Utah, which is about 62% Mormon, has the lowest cancer rate in the United States. Mormons also tend to be happy. They know how to have good, clean fun, are family-oriented, and tend to be married, which is also an indicator of happiness. Mormons are approachable, no matter what their earthly station, and this comes from a focus upon the things of God over the things of man. Mormons live by sexual standards, too. The standard of the gospel is chastity outside of marriage and fidelity within marriage, which is a sacred covenant between a man and a woman. Mormons believe that the family unit is meant to be eternal. Family relationships can continue in heaven. Mormons tend to want to share their beliefs, not only to correct false ideas about them, but also because being a member of the Church is so amazing. We want to share our joy. Like other Christians, we also see missionary work as God’s Great Commission. Not everyone in the world needs to be a Mormon. It takes great commitment and sacrifice. But all need to have the opportunity to decide, and that means they need to hear the gospel. The Church has over 80,000 missionaries serving worldwide, most of them young people between the ages of 18 and 21. Most Mormon Missionaries are Young Single Adults. Of course, an entire vocabulary has evolved so Mormons can communicate with each other about all that goes on within the Church. It’s a jargon that is unique, just like Catholic or Protestant vocabulary is unique. So we’ve provided a glossary of Mormon terms on this website. Why does the Mormon Church Meddle in Politics?